It all started with netbooks, the low-powered budget laptops for day to day use and small and light enough to be taken anywhere. Some years later, netbooks were replaced by tablets like the iPad and Galaxy Note 10.1. Unlike netbooks, these tablets were on mobile OS with limited features and consumers were forced to compromise all the legacy Windows programs for portability of tablets. Thanks to Asus Transformer Book T100TA, consumers no longer have to compromise anything and they can still have a powerful and portable Windows based netbook replacement. Asus Transformer Book T100TA is fully operational Windows 8.1 ultraportable system and can be used either as a tablet or as a clamshell netbook. If you are on a budget and looking for a powerful and long lasting replacement for your netbook under $400 then this is the right choice for u. The Asus Transformer Book T100TA has a very slim profile, the tablet portion is only 0.41 inches thick and with the keyboard dock connected it is only 0.92 inches thick. 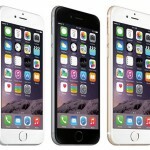 Overall dimensions are 0.92-inch by 10.4-inch by 6.7-inch. The tablet portion is very light and weighs only 1.23 pounds which is lighter than fourth generation iPad. With the dock connected, the overall weight is a little over 2.40 pounds. With these dimensions, it is similar in size with Lenovo IdeaPad Miix 10 and is comparable with Microsoft Surface 2 which is slightly bigger. The body of Transformer Book T100TA is made of polycarbonate plastic which feels cheap when compared with VaporMG metal body of Microsoft Surface 2. The edges of Transformer Book T100TA are curved which makes it comfortable to hold and use for hours. Microsoft Surface 2 and IdeaPad Miix 10, both come without a keyboard dock out of the box and are still expensive compared to Transformer Book T100TA. 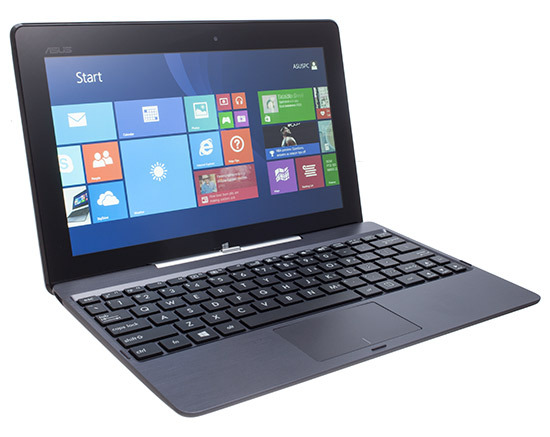 Asus Transformer Book T100TA has a 10.1-inch touchscreen display with 1366 x 768 pixel resolution. The resolution could have been higher, but considering the price and other features it can be ignored. Microsoft Surface 2 is one of its main competitors and comes with a 1080p full HD display but it costs more too. Unless you have very sharp eyes, you won’t be able to differentiate between both displays during day to day usage. The touch screen is capable of recognizing touch from up to 5 fingers at a time. Asus Transformer Book T100TA comes with an IPS display, due to which it has insanely good viewing angles. Acer Iconia W3 is another competitor, but it lacks such viewing angles and has a very dull and poor quality display. The keyboard dock supplied by Asus is very compact and comfortable to use. Though the keyboard lacks backlit keys, it has a full sized USB 3.0 port built-in. The process of attaching the tablet to the dock is very simple and so is the process of undocking. The multi-touch trackpad on the dock is mediocre and sometimes have trouble recognizing initial touches and swipes. The tablet portion has a micro-USB port which can be used for charging and can also be used as a regular USB port through an optional adapter. The tablet has a 31WHr battery which can be charged with a 10W adapter with 2.1Amp output. The battery takes a long time to charge, but it lasts longer too. The sides of tablet also have a micro-HDMI port, micro SD card slot, volume controls, power button, headset jack and a physical Windows/Start button. Asus Transformer Book T100TA has stereo speakers which are loud enough to fill a small room. Surprisingly, the speakers are able to produce most bass notes without clipping, which results in clear and balanced sound. While watching a movie, sound effects are considerably good for a tablet. Online streaming through different applications is smooth and mostly lag free. Wireless connectivity options include Bluetooth 4.0 and Dual band 802.11 a/b/g/n Wi-Fi. Asus also provide Home and Student version of Office suite out of the box with Transformer Book T100TA. While the rival tablets come with Microsoft Office RT version which is similar to the Office suite provided by Asus. Other than Office suite, Transformer Book T100TA comes with Amazon’s Kindle app, Netflix, Skype and few Asus apps pre-installed. It also comes with Asus Reading Mode setting, which allows the tablet to automatically change screen balance which makes it easier to read. The Reading Mode initially works with built-in Mail, Reader and News apps, but the users can later add other applications of their choice. It comes with a standard 1 year warranty and a 30-day zero bright dot display guarantee. The Asus Transformer Book T100TA comes with 1.3GHz Intel Atom Z3740 Quad-core processor, 2GB of memory and 64GB flash storage. The Intel Atom is one of the new 2W processor based on Bay Trail architecture. Unlike its predecessors, Intel Atom Z3740 is surprisingly fast and battery efficient thanks to the new architecture. Along with Z3740, Transformer Book T100TA comes with Intel HD graphics. It also features a 1.2 mega-pixel camera for video calls. Other than the 64GB flash storage, users can increase the storage capacity by adding a micro SD card. Transformer Book T100TA supports micro SD cards up to 64GB and if that’s not enough, Asus also offers unlimited Asus WebStorage free for one year. The new Atom processor is surprisingly good and when combined with full Windows 8.1, it complements the overall performance of Transformer Book T100TA, which is comparable to last generation Intel Core i3 processors. It scored 2330 points on PC Mark 07 which is very close to score of a normal Core i3 powered laptop. It completed the handbreak test in 2 minutes and 41 seconds while the last gen Atom powered systems took up to 10 minutes to complete the same test. 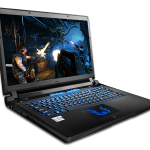 Transformer Book T100TA gave a score of 4 on Heaven Benchmark test with medium settings. The 31WHr battery combined with Z3740 processor proved to be a very good combination, Transformer Book T100TA lasted 11 hours and 20 minutes during the battery test. Rival of Transformer Book T100TA, Dell Latitude 10 managed 9 hours and 20 minutes on the same test, while Lenovo Miix 10 lasted only 7 hours and 20 minutes. Asus Transformer Book is good for day to day task and can manage some light multimedia creation in applications like Photoshop etc. Asus Transformer Book T100TA is the first hybrid tablet in its price range and it has finally overcome the limitations of mobile OS powered tablets. It comes with Windows 8.1 and lets you enjoy the portability of tablet and functions of a fully functional Windows laptop. Thanks to its light weight and portable form-factor it is very good for long typing and work sessions. IT can take you through an entire work day and still have the power to entertain you on your way back home. Transformer Book T100TA is here to stay and has proved its mettle against more expensive competitors like Microsoft Surface 2 and Lenovo Miix 10. If you are on a tight budget and want a fully functional ultraportable windows laptop then Transformer Book T100TA is the right choice. It is considered as the best entry level hybrid tablet and it has the hardware to become your primary PC on a budget.